DIE Veneris, 1m die Februarii. Message from H. C. with a Bill; to return some; and for a Conference on the Plague Bill. Bill to explain the Poll Tax Bill. Judges to attend the Committee for L. Norris's Bill. Precedents about H. C. defining Conferences concerning Proceedings upon Judicature by the Lords. Recusant Peers, &c. not to be prosecuted during Privilege of Parliament. Love & al. to he heard. Hodie 1a vice lecta est Billa, "An Act for enabling Trustees to make Leases, for Payment of the Debts, and providing for the Children, of Sir Charles Stanley." It was moved, "That the Question might be put, for the Rejection of this Bill." Then the Question being put, "Whether that Question shall be put?" The Earl of Anglesey reported, "That the Committee have considered the Bill for Relief of Poor Prisoners, as fit to pass, with some Amendments." The said Amendments, being read Twice, were Agreed to. Hodie 3a vice lecta est Billa, "An Act for Relief of Poor Prisoners, and setting them on Work." Hodie 1a vice lecta est Billa, "An Act to prevent the Disturbances of Seamen, and to preserve the Stores belonging to His Majesty's Royal Navy." Hodie 2a vice lecta est Billa, "An Act for punishing and suppressing of Atheism, Prophaneness, and prophane Cursing and Swearing." The Question being put, "Whether this Bill now in Debate shall be committed to a Committee of the whole House?" Epus. Rochester. Ds. Berkley Berk. 1. 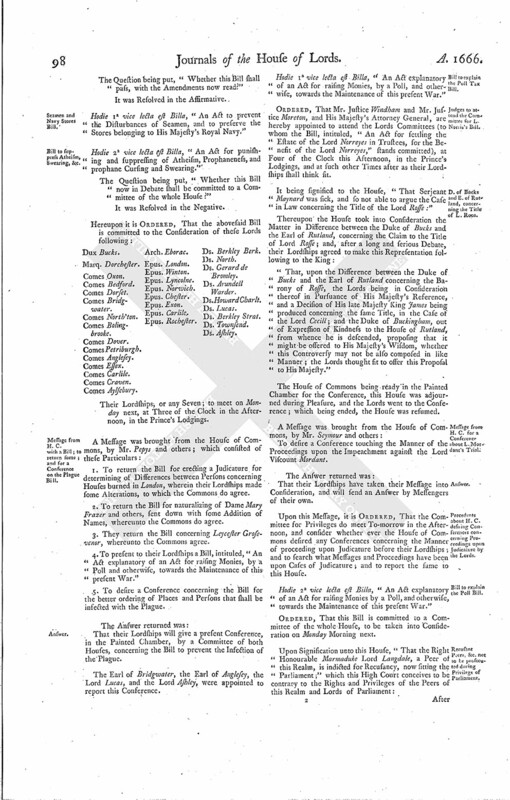 To return the Bill for erecting a Judicature for determining of Difference between Persons concerning Houses burned in London, wherein their Lordships made some Alterations, to which the Commons do agree. 2. To return the Bill for naturalizing of Dame Mary Frazer and others, sent down with some Addition of Names, whereunto the Commons do agree. 3. They return the Bill concerning Leycester Grosevenor, whereunto the Commons agree. 4. 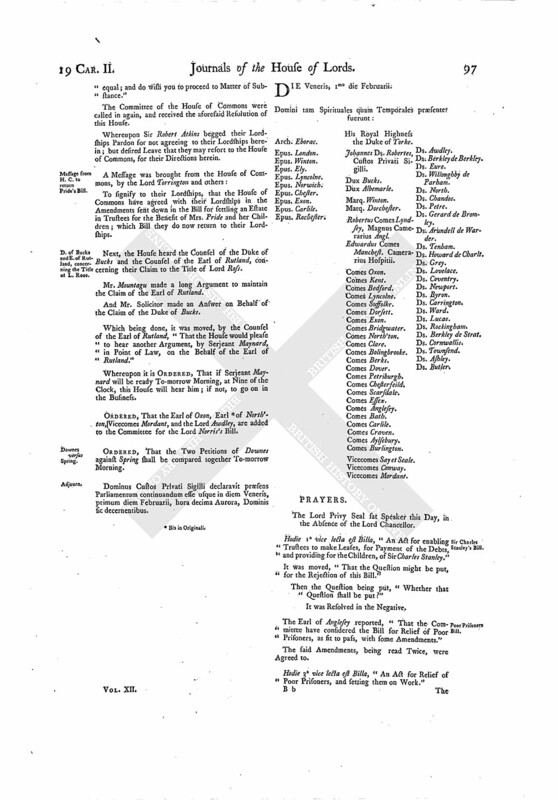 To present to their Lordships a Bill, intituled, "An Act explanatory of an Act for raising Monies, by a Poll and otherwise, towards the Maintenance of this present War." 5. To desire a Conference concerning the Bill for the better ordering of Places and Persons that shall be infected with the Plague. That their Lordships will give a present Conference, in the Painted Chamber, by a Committee of both Houses, concerning the Bill to prevent the Infection of the Plague. The Earl of Bridgwater, the Earl of Anglesey, the Lord Lucas, and the Lord Ashley, were appointed to report this Conference. Hodie 1a vice lecta est Billa, "An Act explanatory of an Act for raising Monies, by a Poll, and otherwise, towards the Maintenance of this present War." ORDERED, That Mr. Justice Windham and Mr. Justice Moreton, and His Majesty's Attorney General, are hereby appointed to attend the Lords Committees (to whom the Bill, intituled, "An Act for settling the Estate of the Lord Norreyes in Trustees, for the Benefit of the Lord Norreyes," stands committed), at Four of the Clock this Afternoon, in the Prince's Lodgings, and at such other Times after as their Lordships shall think fit. It being signified to the House, "That Serjeant Maynard was sick, and so not able to argue the Case in Law concerning the Title of the Lord Rosse:"
"That, upon the Difference between the Duke of Bucks and the Earl of Rutland concerning the Barony of Rosse, the Lords being in Consideration thereof in Pursuance of His Majesty's Reference, and a Decision of His late Majesty King James being produced concerning the same Title, in the Case of the Lord Cecill; and the Duke of Buckingham, out of Expression of Kindness to the House of Rutland, from whence he is descended, proposing that it might be offered to His Majesty's Wisdom, whether this Controversy may not be also composed in like Manner; the Lords thought fit to offer this Proposal to His Majesty." The House of Commons being ready in the Painted Chamber for the Conference, this House was adjourned during Pleasure, and the Lords went to the Conference; which being ended, the House was resumed. To desire a Conference touching the Manner of the Proceedings upon the Impeachment against the Lord Viscount Mordant. That their Lordships have taken their Message into consideration, and will send an Answer by Messengers of their own. Upon this Message, it is ORDERED, That the Committee for Privileges do meet To-morrow in the Afternoon, and consider whether ever the House of Commons desired any Conferences concerning the Manner of proceeding upon Judicature before their Lordships; and to search what Messages and Proceedings have been upon Cases of Judicature; and to report the same to this House. Hodie 2a vice lecta est Billa, "An Act explanatory of an Act for raising Monies by a Poll, and otherwise, towards the Maintenance of this present War." ORDERED, That this Bill is committed to a Committee of the whole House, to be taken into Consideration on Monday Morning next. After Consideration had thereof, it is ORDERED, by the Lords Spiritual and Temporal, in the High Court of Parliament assembled, That the said Lord Langdale, and all others Members of this House, as also their Wives, Children, and menial Servants, and all Widows of Peers, shall be, and are, freed and discharged from any such Indictments as aforesaid; and that such Indictments against any the Parties abovementioned shall be forthwith brought into the King's Bench by Certiorari, and the King's Attorney shall enter a Non Pros. upon the same, that thereby the said Lords of Parliament, their Wives, Children, and Servants, and Widows aforesaid, may enjoy the Privilege of this House, both during the Time of this Session of Parliament, and for the Space of Twenty Days after the End of the same. To all Mayors, Sheriffs, Bailiffs, Constables, Churchwardens, Tithing-men, and all other His Majesty's Officers and Ministers to whom this may any Way appertain. 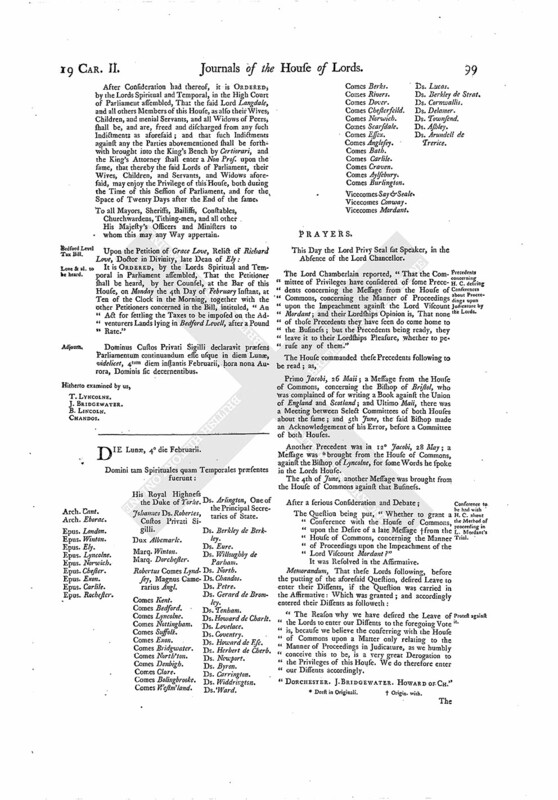 It is ORDERED, by the Lords Spiritual and Temporal in Parliament assembled, That the Petitioner shall be heard, by her Counsel, at the Bar of this House, on Monday the 4th Day of February Instant, at Ten of the Clock in the Morning, together with the other Petitioners concerned in the Bill, intituled, "An Act for settling the Taxes to be imposed on the Adventurers Lands lying in Bedford Levell, after a Pound Rate." Dominus Custos Privati Sigilli declaravit præsens Parliamentum continuandum esse usque in diem Lunæ, videlicet, 4tum diem instantis Februarii, hora nona Aurora, Dominis sic decernentibus.